These days, everyone wants to be seen playing a modular synthesiser - whether they know what they're doing or not! Yet 20 years ago, the electronic music scene was a very different place. Samples ruled the airwaves - either looped and chopped or as a quick and easy substitute for actual instruments. Most synthesisers were little more than glorified ROMplers - with limited ROM, at that. Musicians were only beginning to remember their grandads' old analogue instruments, and many a classic synth could still be had for a pittance. It was into this environment that Clavia had successfully lobbed their virtual analogue Nord Lead, achieving critical praise and sighs of relief from synthesists half blinded from peering into one too many LCD displays. The Nord Lead captured the old-school immediacy of classic analogue synthesisers in modern form, with none of the quirks that plagued the real things. The Nord Lead's follow-up would not bow so reverently to the vintage gods of yore. While it offered many features favoured by retro-fetishists, the Nord Modular was equally forward-thinking, requiring a then-cutting-edge computer in order to do any deep patching. The idea was simple: a hardware synth festooned with knobs for immediate tactile access to tweakable parameters, yet chock full of DSP that could be deeply programmed via a software editor. Said editor offered access to over 100 modules that could be lashed together with virtual patch cables. There were oscillators, filters, envelope generators, LFOs, sequencers and all manner of exotic modules designed to perform logic and math functions. 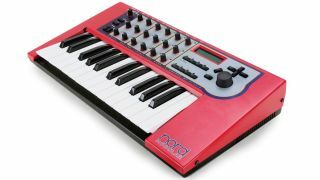 If this sounds not a million miles away from today's software modular environments such as Reaktor or Max/MSP, the Nord differed in that the hardware instrument could be detached from the computer and carted off to a gig. It was a clever design and a welcome one in those heady days of 90MHz processors and Windows 98! Indeed, while other hardware instruments of the 90s can still be used in a modern setting should you want to do such a thing, the Nord Modular's dependence on software editors hobbled it with a sell-by date. Clavia trundled out a few variations on the theme. Initially dispatched with a diminutive two-octave keyboard, it was joined by a rack-mountable version and followed by a cut-down 'Micro' edition. A slicker 'G2' revamp came in 2004, with sleeker, friendlier hardware, built-in effects and new physical modelling algorithms. The G2 model came in keyboard form (three- and five-octave models) and as the G2 'Engine', a spartan single-space rack unit. Never a massive seller, the Nord Modulars were loved by those who bought them. Easy to patch and with a distinctly (often defiantly) digital sonic signature, it seemed for a while to realise the potential of modular synthesis. It seems an odd choice to release a fully functional native demo version of a premium hardware/software combo, but that's exactly what Clavia did, in an attempt to turn potential buyers on to their second-gen Modular. With nearly every module on tap, the standalone demo only leaves out polyphony. It's available to Windows or pre-Lion Mac users. An open-source hardware/software combo that can be detached from the software editor and played sans computer. The hardware consists of a tiny PCB with audio and MIDI I/O. It can be used as is or built into a custom enclosure. With over 630 factory modules and another 613 available from the user community, Axoloti offers limitless possibilities. Another open-source option, Wren is a standalone native modular synth for Windows. It was designed by a Nord Modular aficionado and bears a resemblance to the Nord's software editor. It's not meant to duplicate the Nords, but offers a powerful patching environment and is winning over a lot of would-be Nord users.